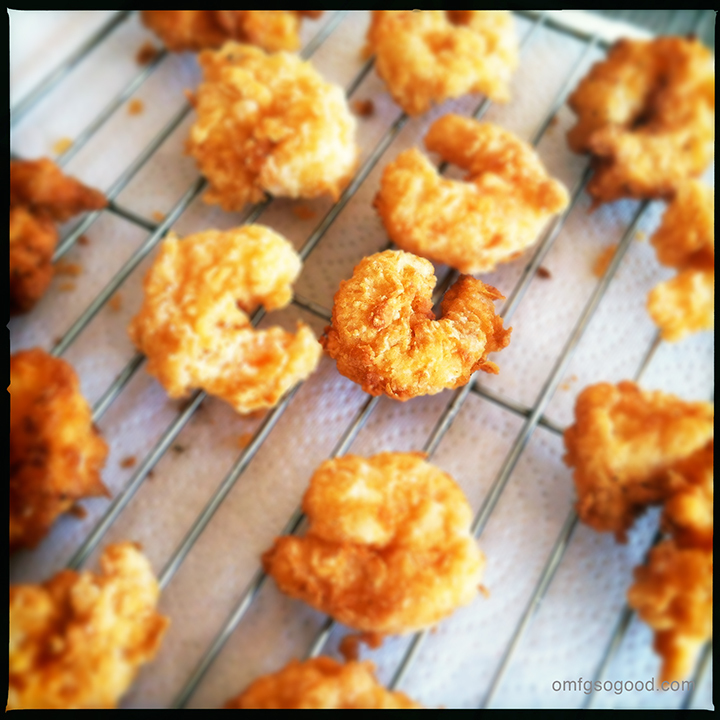 crispy spicy shrimp | omfg. so good. It’s official. Jonny and I may never be able to go out to eat again. Of course, that’s somewhat of an exaggeration. But until our kids stop finding it amusing to act out scenes from Wreck-it-Ralph in public, we’ll be sticking close to home. Since the little wreckers are forcing us to ‘take a break’ from our favorite restaurant relationships, I’ve perfected the art of copycat style recipes. 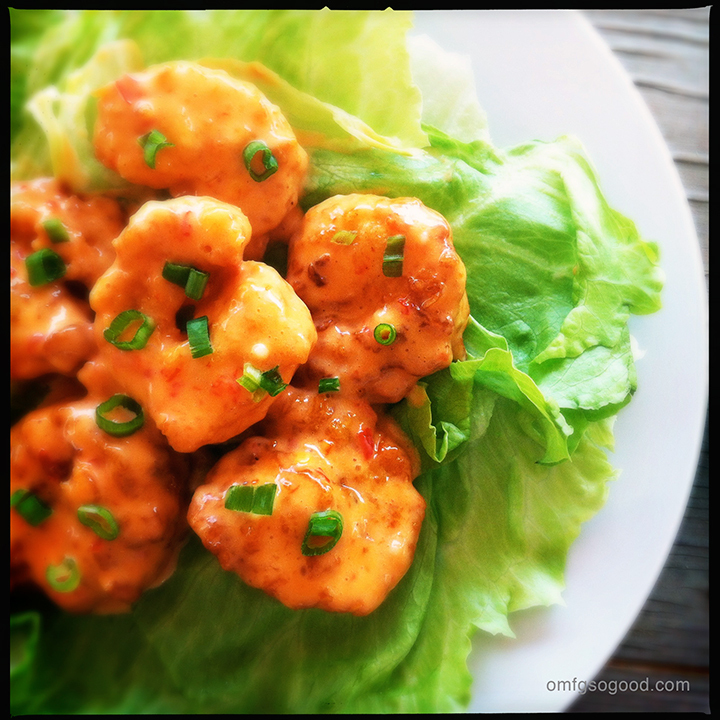 A few weeks ago I busted out this at home version of Bonefish Grill’s Bang Bang Shrimp, but in an effort to stay somewhat healthy, I swapped out what I can only assume would be mayo in the original recipe for greek yogurt, and fried these bad boys up in canola oil to cut down on the saturated fats. That sh*t is bad for you. Scientific fact. To make the sauce, mix the greek yogurt, chili sauce, sriracha, honey, garlic powder, salt and water in a bowl. Set aside. To make the shrimp, heat around 2″ of canola oil to 350 degrees in a heavy saute pan over medium-low heat. While the oil is heating, whisk the eggs in a small bowl. Combine the flour, cornstarch, salt and pepper in another small bowl. Set up a wire rack over paper towels. Working in batches, dredge the shrimp first in the flour mixture, then the egg, then back in the flour again to form a thick coating. Fry in the preheated oil for 1 – 2 minutes or until golden brown and crispy. Adjust the heat as needed to maintain the 350 degree oil temperature. Use a slotted spoon to transfer the cooked shrimp to the prepared wire rack. After all of the shrimp are fried, lightly toss them in the bowl of yogurt/chili sauce to evenly coat, then arrange on serving plates atop leaves of the bibb or butter lettuce. Garnish with thinly sliced scallions. This meal was pretty darn close to what we would have eaten had we gone out, but cheaper and probably much healthier. And, the kids got to eat at their mini-table with special plates of fried shrimp and applesauce for dippin’. Of course, they were perfect little angels. Angels that yell “I’m gonna WRECK IT!” But at this point, I’ll take what I can get. Looks and sounds delectable. Only one problem, I don’t like shrimp. How do you think it would taste if I subbed it with chicken? I actually almost made it with chicken but bought the shrimp at the last minute. I think it would be fantastic!